Here are my photographs of the windmill at Windmill Hill in Sussex I know it's not a gothic or medieval structure but I like windmills and this one is in my cousins front garden which gave me a great opportunity to get some photos of something different. The mill stands 48 feet tall making it the tallest in Sussex and the second tallest in the UK. It was built around 1814 but had it's sweeps removed in 1894 when it was converted to steam power until its closure around 1913. 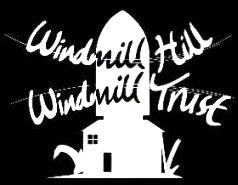 In 1993 Paul (my Cousin) & Bee Frost bought the windmill with plans to restore it and they set up the Windmill Hill Windmill Trust in 1996. Then in 1999 with funding from the English Heritage and a couple of local councils they were able to erect a roofed scaffolding to protect it and allow surveys to be carried out, it was discovered that more work than expected was required but in late 2001 they were awarded �7,000 by the Heritage Lottery Fund towards the �0,000 that was required. More money is still required to get the windmill in fully working order (�0,000 at the time of writing this) but hopefully one day it will produce flour once more. The external photographs were taken on the 25th of July 2008 and the internal ones on the 27th of July 2008.